The first unit of the year painted - these are the new plastic Oathmark goblins, plus a metal promotional figure as leader. 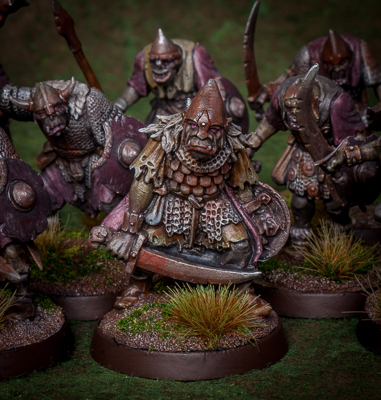 My main aim when painting them was to do so speedily and to follow the same style and palette as my Mordor orcs. So these are mostly just a base coat and a glaze or wash to provide some easy shading. I wrote a more in depth tutorial on how to paint Mordor orcs, which I referred back to as a guide for these figures. Very nicely done - a great paint job, even leaving aside that it was a speed-run. I'm very jealous! I have to admit to having been a bit sceptical about these new goblin miniatures. I felt their poses looked a bit too much like the old space marines - shoulders hunched forwards and holding their firearms out in front for inspection. But your paint job has swayed me - seeing them as a cohesive (colour-wise, at least!) group rather than a collection of hunched over grey individuals makes a great difference. I'm still dubious as to their use for skirmish games where they are each an individual - it's a struggle to warm to their pose - but as groups, they do work well. Well they are designed for mass battle games, so you are expecting a lot for skirmish games. They are fine for this purpose, looking good en masse. They do have a hunched appearance, that's a deliberate design element I think. They are not the best figures in my collection, but they are certainly far from being bad. For the money I think they are pretty decent. I really like the way that you have painted them - the earthy tones bring a seriousness to the models. I’ve been thinking about using them for D&D instead of GW’s Moria Goblins, I’m hoping that the Oathmark Orcs are even larger. If they are, I may swap to Oathmark for mooks. I use Otherworld minis for characters which are bigger than LotR, so OW minis always look bigger than Or s which isn’t right. Really like what you’ve done with the figures. I suppose I've just been spoilt by the Frostgrave plastics! They certainly look better than my first impression of them.